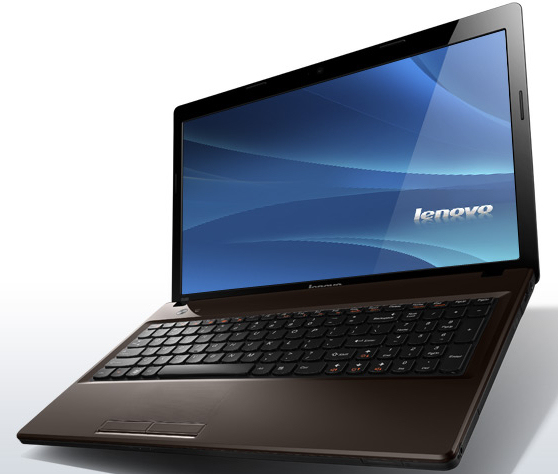 Lenovo launches the G585 as a successor for the Lenovo G575 on the market. As with the G575 already, Lenovo is applying again the AMD fusion technology with the G585. The AMD Brazos 2.0 platform is used, to be precise. 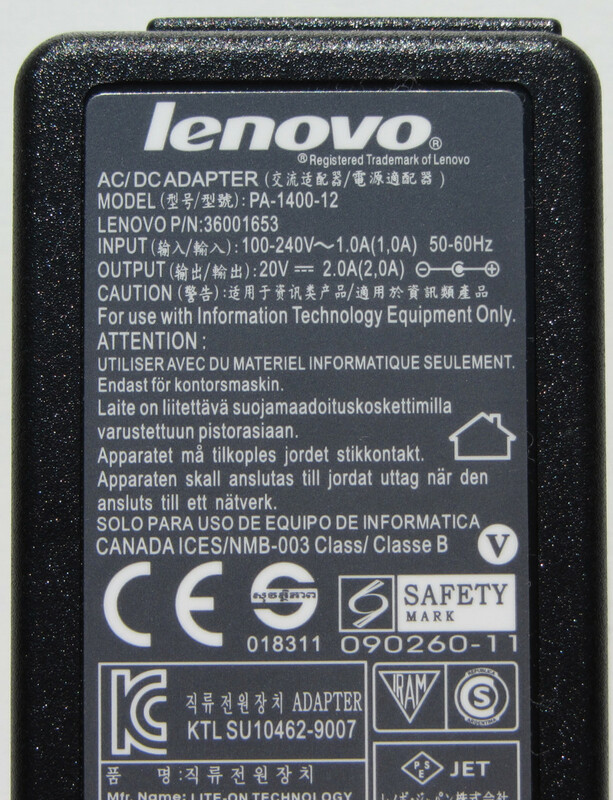 The Lenovo G575 still uses the first Brazos generation. The Brazos platforms were originally designed for netbooks, and Lenovo is simply packing this netbook technology into a notebook casing now. There is an interesting idea behind the G585: It combines the advantages of a netbook (low energy consumption) with the much larger and more comfortable screen (there is a 15.6-inch display used) of a conventional notebook. This should result in a quiet, low power consuming office notebook, residing at the bottom of the performance scale with a supposed long life span. This combination did not work out so well with the G575. On the one hand, we commended the battery life and low power consumption, on the other hand, we complained about the noise of the notebook and the bad display. 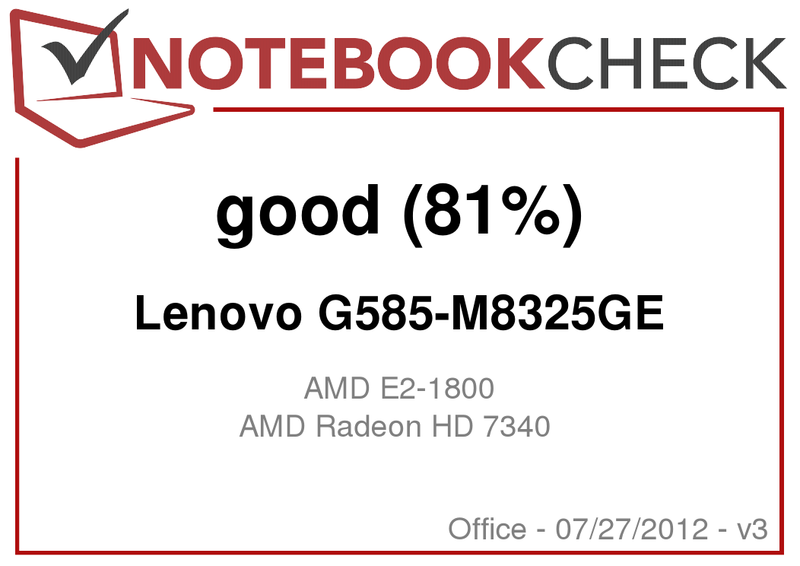 Whether Lenovo does a better job with the G585, our test will show. Our test model contains a dual-core processor (AMD Vision E2-1800), a graphics chip from AMD (AMD Radeon HD 7430), 2 GB RAM, a DVD burner and a hard drive with a storage capacity of 320 GB. Competitors of the Lenovo G585 are, in addition to the previous model, Lenovo G575; the HP 635 LH416EA, the Acer Aspire 5253 and Acer TravelMate 5744Z-P624G50Mikk. 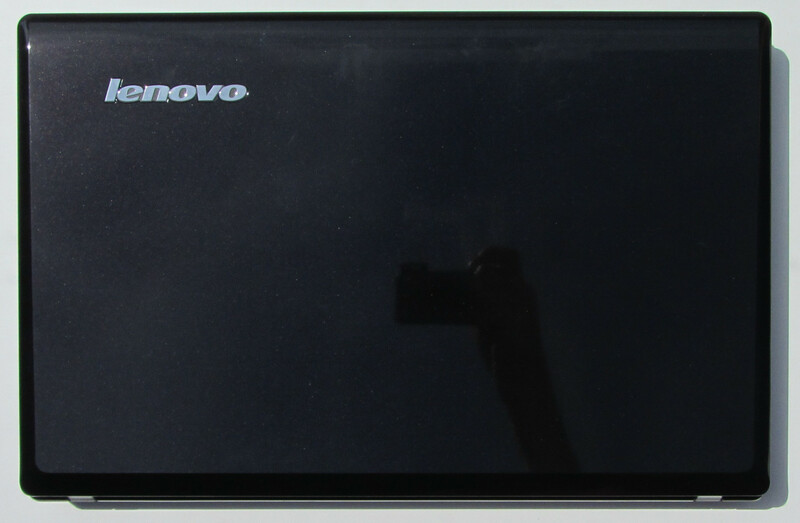 Lenovo puts all the technology into a black, shiny plastic casing. The notebook is predominantly designed in piano black finish. Only the lower part of the notebook is made of matte plastic. 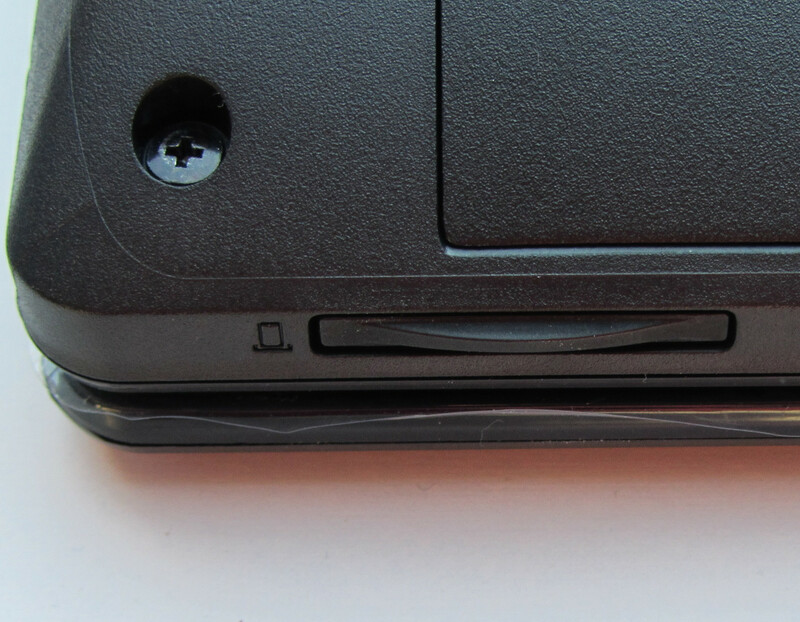 The previous Lenovo G575 has an entirely matte casing (only the display frame is shiny). The shiny surface appears quite stylish and spares the usual cheap charm. In an office device, however, one rather desires a matte appearance. The shiny finish is definitely an eye-catcher here. The design of the casing is simple. The surfaces are completely smooth and without decorations or the like. The casing makes a generally sturdy impression. Under pressure, it bends only slightly. The area below the optical drive makes a good impression too. The casing of the G585 is stiffer than that of the G575. It can be twisted only a little bit when lifting up. This is an improvement compared to the G575. The clearances are not always completely tight. The hinges hold the screen stable in position. The lid bounces when the notebook is being shaken - for example, on the train or in the car. Altogether it can be said that the buyer does gets a satisfying casing, which is not always the case at a price of 339 Euro (~$428). The G585 brings style into every apartment. Even the lid is shiny and mirrors. Only the bottom consists of matte plastics. In terms of connectivity, Lenovo surprised with two USB 3.0 ports. Two connections of this type are currently rare in such low-priced devices. The two connections are on the left-hand side. Those who want to use the device as a DVD player for a domestic flat-screen television will be delighted by the HDMI port. 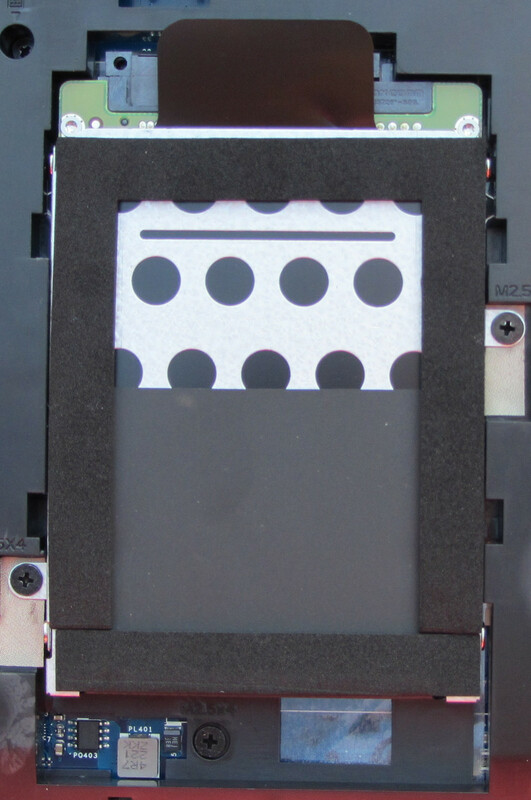 Besides the mentioned ports, a VGA slot and an Ethernet port are located on the left-hand side. On the right-hand side of the device is a third USB port, which only supports the USB 2.0 standard. In addition, there is a combo port for headphones and a microphone available. The memory card reader is located at the front of the notebook. This computer allows the use of SD and MMC cards. Our test model comes with the expected range of communication devices. This means we find a WLAN module from "Atheros" ("AR9285") in the notebook. The module supports 802.11 b/g/n. In terms of Ethernet, the unit disappoints a bit. Lenovo merely installed a Fast-Ethernet chip. A Gigabit-Ethernet chip should really be standard these days - even in notebooks in the lower-price range. A Bluetooth module also found its way into the machine. However, our test model - contrary to what some online stores list - contains a Bluetooth 3.0 module, not a Bluetooth 4.0. For followers of video calls á la Skype, Lenovo packs a webcam (0.3 megapixels) into the frame of the screen case. The low price of 339 Euros (~$428) must demand its toll at some point. This happens in the range of accessories. Lenovo saves money on the operating system. Our tester comes without a Windows 7 operating system. Merely a DOS operating system is installed. To carry out our various tests, we installed Windows 7. If you want to use Windows 7, you will have to buy it yourself. 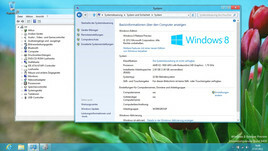 The version "Windows 7 Home Premium" is currently available for about 60 to 80 Euros (~$76 to $101). The necessary drivers are included for the notebook on an additional DVD. 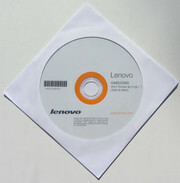 Alternatively, the drivers can be downloaded from the Lenovo website. Of course, other operating systems can be used as well. Here, however, it should be checked before whether drivers are available for the operating system. 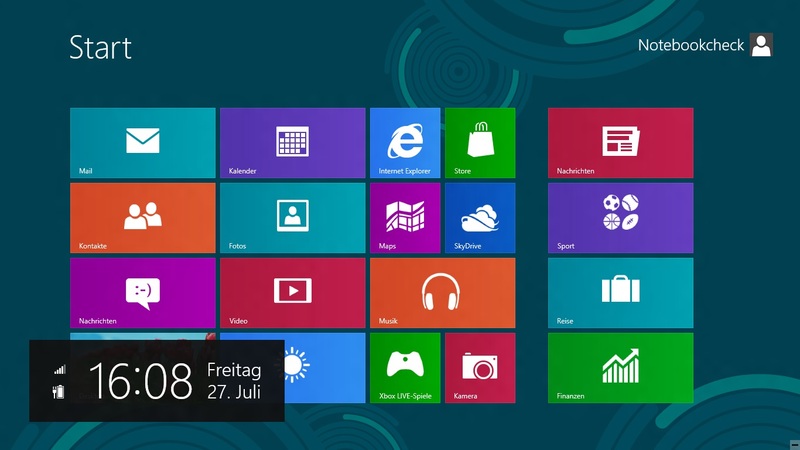 We tried the OS Windows 8 (Preview Release, 32-bit version) and Ubuntu Linux 12.04 (64-bit). Both operating systems work fine. Windows 8 does not come with drivers for the Bluetooth module and the memory card reader. A driver for the Bluetooth module could be installed from the Windows update later on. 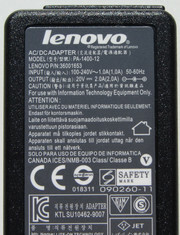 To activate the memory card reader, we used the corresponding Windows 7 drivers from the Lenovo website. Ubuntu Linux 12.04 was running without any difficulties as well. WLAN module, webcam, memory card reader and Bluetooth worked immediately. The video acceleration could be activated by the subsequent installation of AMD drivers. It was possible to play our test video (FullHD, H.264) without any difficulties. YouTube videos in full HD resolution played smoothly after the additional installation of Adobe Flash Player as well. The maintenance of the notebook is not a problem. There is a large service door at the bottom, which provides access to most components. 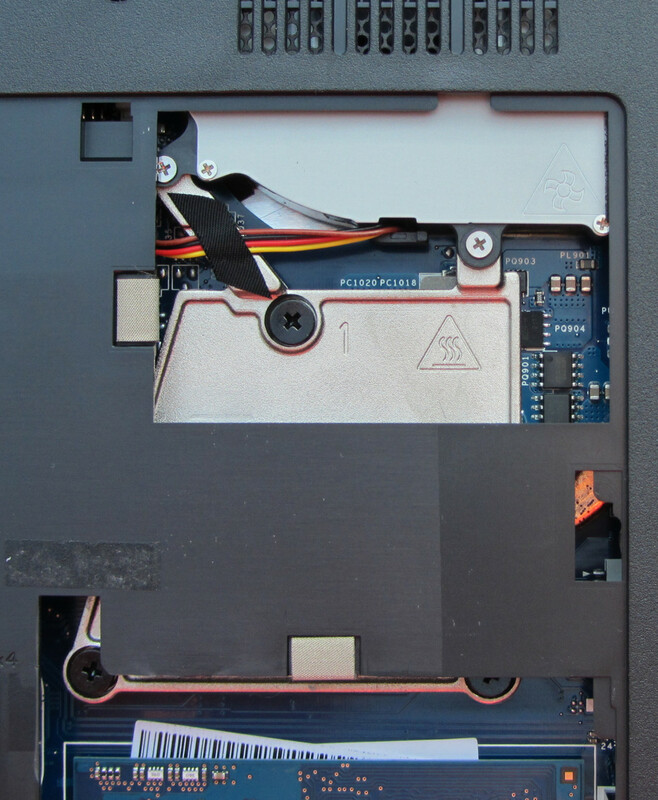 It was possible to easily replace the integrated hard drive with a different model. The hard drive cage is held by two screws only. Upgrading the RAM is a piece of cake. 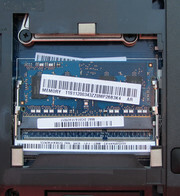 Only one of the two available memory banks is used. The notebook can use up to 16 GB of memory. Anyone who wants to double the existing 2 GB to 4 GB must invest about 15 Euros (~$19) at the moment. There is access to the wireless modules as well. Access to the fan is limited. The notebook comes with a 12-month carry-in warranty. The customer sends the notebook directly to Lenovo in case of technical difficulties. 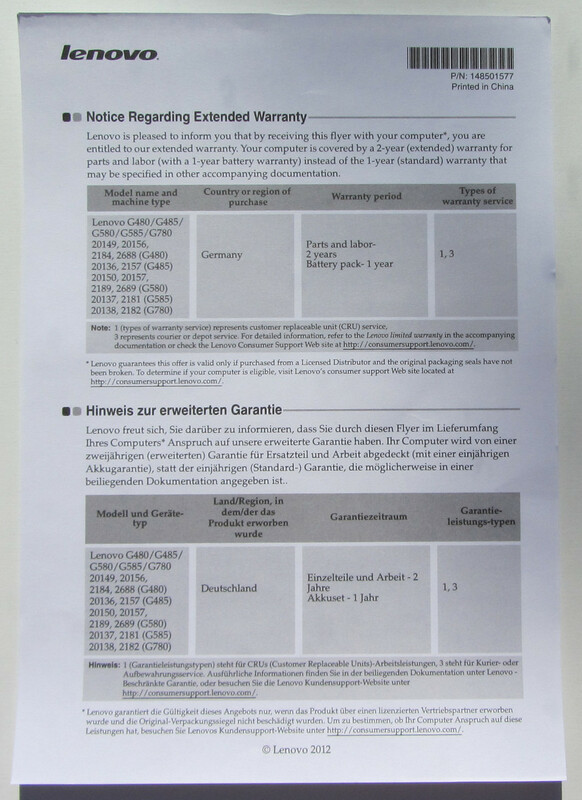 Lenovo offers to extend the warranty period to 24 months for about 30 Euros (~$38). In the case of our test model, however, this would not be necessary. Hidden between the manuals of the notebook was a little note giving the buyer an extended warranty of altogether two years. That is a really nice gesture. Usually, such cheap laptops get a 12-month warranty only. 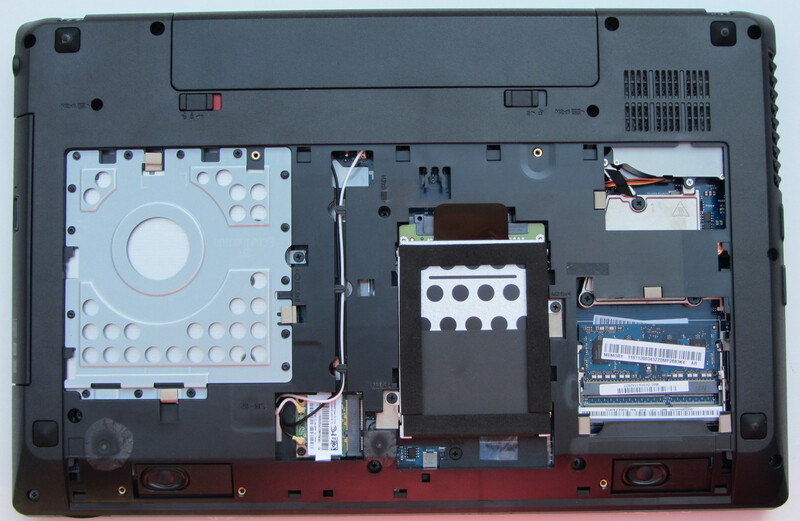 We do not know whether this extended warranty is included in every Lenovo G585. There is the possibility that the extension is reserved to particular merchants. The exception is the battery, where the buyer still gets the usual one-year warranty. 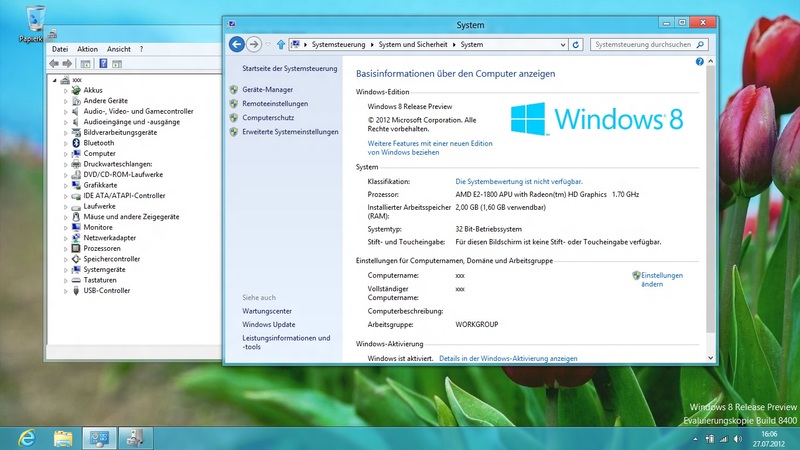 Windows 8 runs smoothly on the G585. All necessary drivers are available. 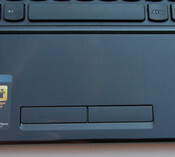 The Lenovo G585 has a chiclet style keyboard (called "AccuType" keyboard by Lenovo) including a numeric keypad. Like the keyboard of the Lenovo G575, the G585 keyboard makes typing really pleasant. The keys have a sufficient key stroke. 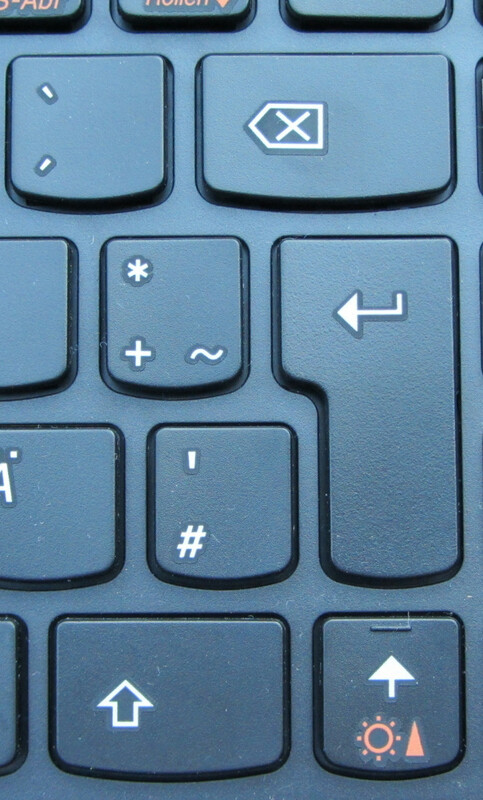 The "enter", "backspace" and the right "shift" key are smaller than usual. These keys can easily be missed but you get used to it after a while. People writing a lot get a good keyboard in an affordable notebook here. The touchpad has a size of 9.7 cm x 4.7 cm (3.8 x 1.9 inches) and is part of the palm rest. Touchpad and palm rest overlap without edges. The touchpad's surface is slightly dimpled. The fingers can easily slide over the surface. 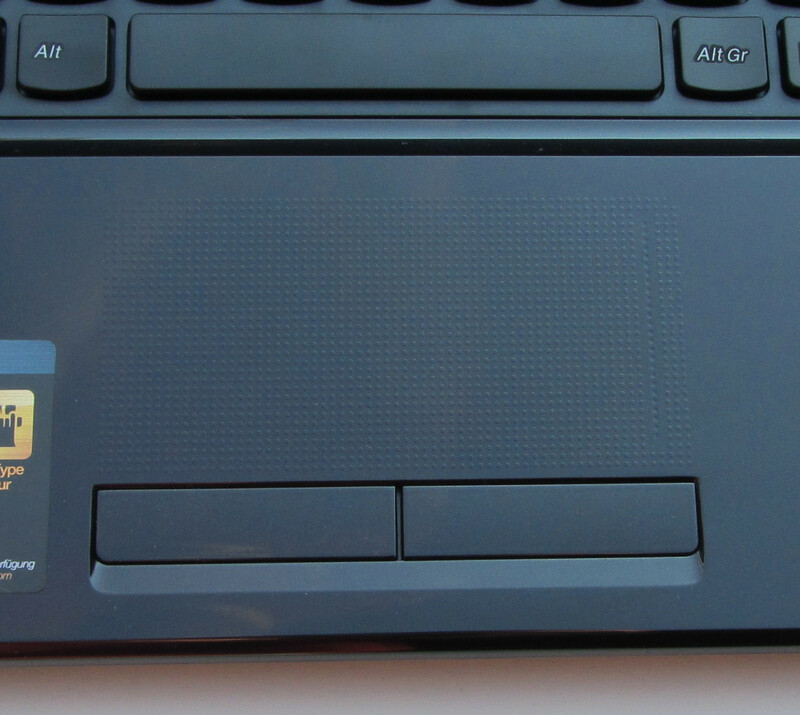 The two mouse buttons sit beneath the touchpad. Both have a clear pressure point. The touchpad is from Synaptics and is multi-touch capable. Functions such as zooming-in with two-finger gestures are therefore available. Lenovo launches the computer on the market with a 15.6-inch display, common and expected in this price range, which has a native resolution of 1,366x768 pixels. The screen surface is glossy. LEDs illuminate the display. Lenovo does not offer other displays. For such a low-priced notebook, the Lenovo model has an unusually bright display (averaging 236 cd/m²). Even much more expensive computers will not reach this in most of the cases. The screen illumination is fine, too. The situation is different for contrast and black level. Here you will notice again that the display is in a very low-cost notebook. The black level is relatively high with 1.61 cd/m. Black areas are shown in shades of gray. Also, the contrast ratio of 145:1 is not worth mentioning. It's not fun to watch movies on the screen. Dark colors blur into a gray mass. 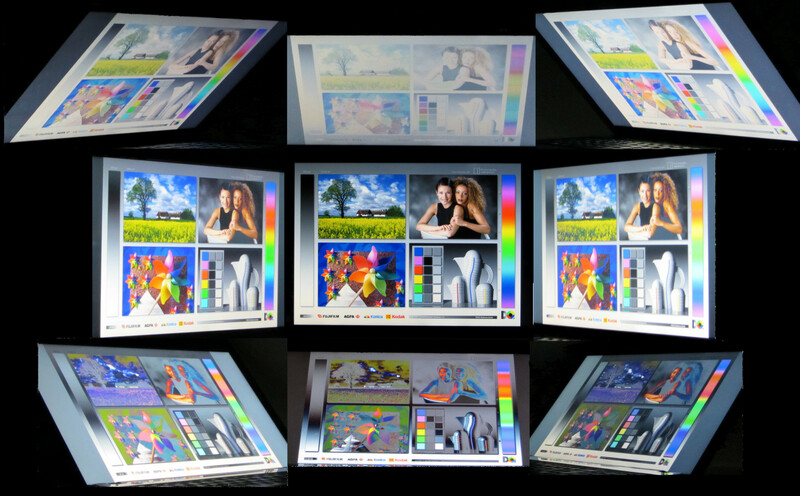 It works better with animated films, which offer many intense and bright colors. It is better to watch movies on this display in a darkened room. Basically, the screen brightness is sufficient for outdoor use. Direct sunlight, however, should be avoided. Otherwise, the reflective surface would make using the computer difficult. The low contrast of the display makes it necessary to avoid direct sunlight as well. The Lenovo G585 handles shadows comfortably. We should not forget about the shiny casing of the notebook. In direct sunlight, reflections of the casing may distract you. Changing the vertical viewing angle quickly makes the image collapse. The situation is different with the horizontal viewing angle. In this case, the image remains stable at a larger angle. All in all, this result is not surprising. The Lenovo G585 is playing in the office equipment league. It is supposed to manage everyday tasks such as chatting, surfing in the Internet, playing YouTube videos, watching DVDs and word processing. It's also good as a video player station in the living room, because it works quietly and has an HDMI port. Currently Lenovo offers another variation of the G585 (AMD Vision C-60, AMD Radeon HD 6290). This is based on the first AMD Brazos platform and has a weaker processor. The device, however, comes with Windows 7. The price is currently around 370 Euros (~$467). Note: A screenshot of GPU-Z cannot be provided at this point. The tool could not read all the data to the GPU and got stuck during every attempt. Lenovo designed the Lenovo G585 with an APU (Accelerated Processing Unit - a combination of CPU and GPU) from the company AMD. 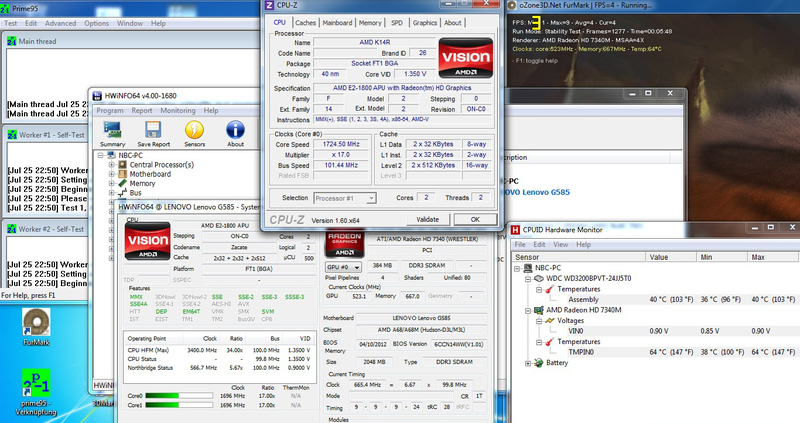 This is called "AMD Vision E2-1800". The CPU part of the APU consists of a dual-core processor that operates at a speed of 1.7 GHz. The full power of the processor is available even in battery mode. The operating speed of the GPU, however, reduces from 523.1 MHz down to 283.3 MHz. AMD has designed the APU for usage in netbooks or subnotebooks. Therefore, the TDP of the APU is correspondingly low with 17 Watts. This is on par with ULV processors from Intel. The competitors of the E2-1800 are not Intel’s core processors, but Intel’s Atom processor and eventually slow Celeron processors, too. In the Cinebench test, the E2-1800 is positioned on the same level as other netbook processors like the Intel Atom or the AMD E-450. In the PCMark tests, the Lenovo G585 can compete against competitors such as the Lenovo G575 (AMD E-350, AMD Radeon HD 6310), the HP 635 LH416EA (AMD E-240, AMD Radeon HD 6310) and the Acer Aspire 5253 (AMD E-350, AMD Radeon HD 6310), which also rely on netbook technology. The situation is different with machines that have 'real' notebook CPUs, such as the Acer TravelMate 5744Z-P624G50Mikk (Intel Pentium P6200, Intel HD Graphics). They are ahead of the Lenovo G585. Even if the Windows 7 performance index represents the processor as the weakest component, it must be said that in daily use, the hard drive is the weakest link in the chain. Starting applications or installers and accessing files is painfully slow. 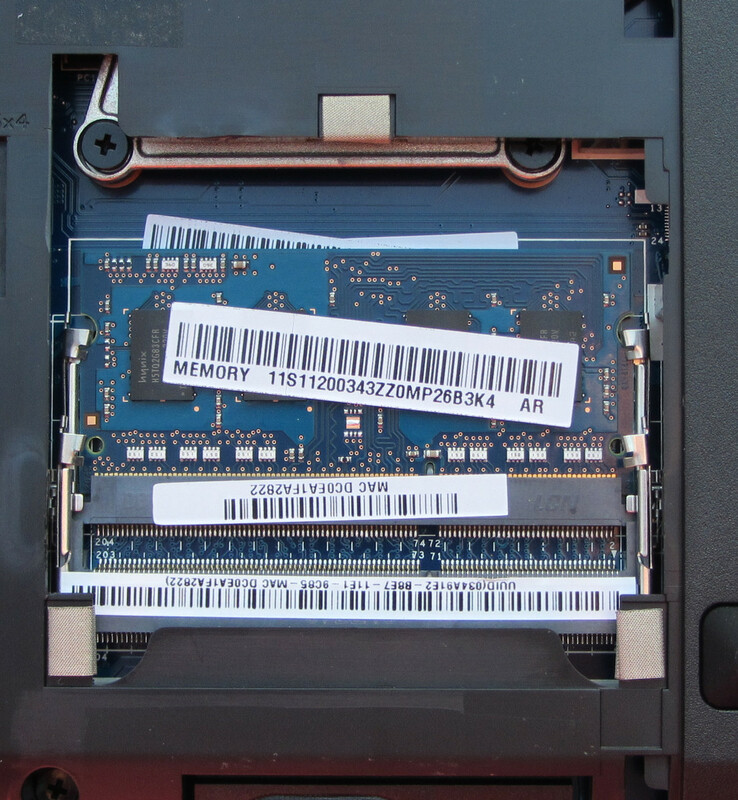 We checked it out and installed a used SSD (Crucial C300 64 GB, used price about 50-60 Euros (~$63 - $76)) into the notebook and were more than pleasantly surprised. The system ran much smoother. 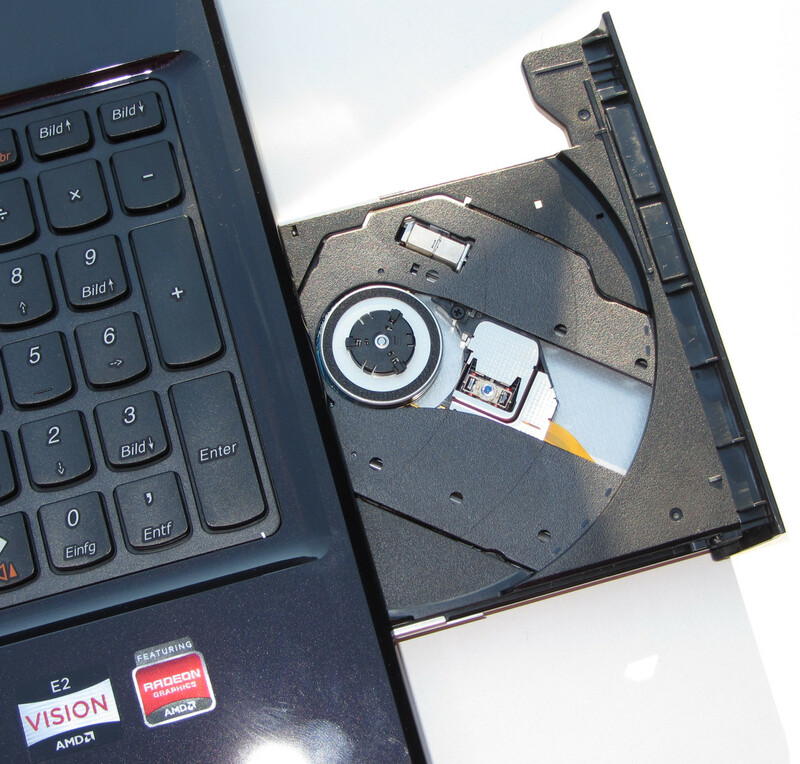 We recommend any buyer to replace the hard disk. Even brand new SSDs with capacities of 120 GB are currently available at a price of about 80 - 100 Euros (~$101 - $126). Those who do not require large amounts of storage space should think about it. Lenovo designed the G585 with a hard drive from the Scorpio Blue series by Western Digital. The hard drive offers a storage capacity of 320 GB and operates at a speed of 5,400 revolutions per minute. The average transfer rate of 59.5 MB/s is to be positioned in the rear middle at best. The access time of 20.9 ms is too high. As already mentioned earlier, the hard drive does not respond very well in daily usage. The execution of programs and applications takes too much time. The GPU part of the AMD Vision E2-1800 APU is labeled "AMD Radeon HD 7340". It is a graphics chip from the beginner’s class. It supports DirectX 11 and Shader Model 5.0. The chip operates with a speed of 283.3 MHz in idle mode, which is about 40% faster than the AMD Radeon HD 6310 graphics chip, which is in the APU of the Lenovo G575. The base rate of the Radeon HD 7340 is 523.1 MHz and can be accelerated up to 680 MHz per Turbo. This happens automatically. In battery mode, the GPU runs at a constant speed of 283.3 MHz. The test results of the various 3DMark versions are on the level of Intel's HD Graphics (Sandy Bridge) chip. The previous model Lenovo G575 is doubtlessly beaten in every 3DMark benchmark. The Lenovo G585 even outperforms the competitors HP 635 LH416EA, Acer Aspire 5253 and Acer TravelMate 5744Z-P624G50Mikk. For a device like the G585, the 3D performance is absolutely second-class. Therefore the 3DMark results do not matter too much. The GPU is much more useful for another reason: It comes with an integrated video decoder (AMD UVD3 decoder). This takes over most of the work of the video playback. And this task it performs well. We played a test video (FullHD resolution, H.264) on the G585 and observed the CPU load. This was predominantly (significantly) less than 25%. Short-term peaks of up to 50% were also observed. It was a similar situation when playing YouTube videos of the same quality. The Lenovo G585 is not a computer for those gamers playing highly elaborate computer games. It was never designed to. Even in the lowest quality level, the frame rate does not suffice to provide a smooth gaming experience. However, this is perfectly fine and also expected. 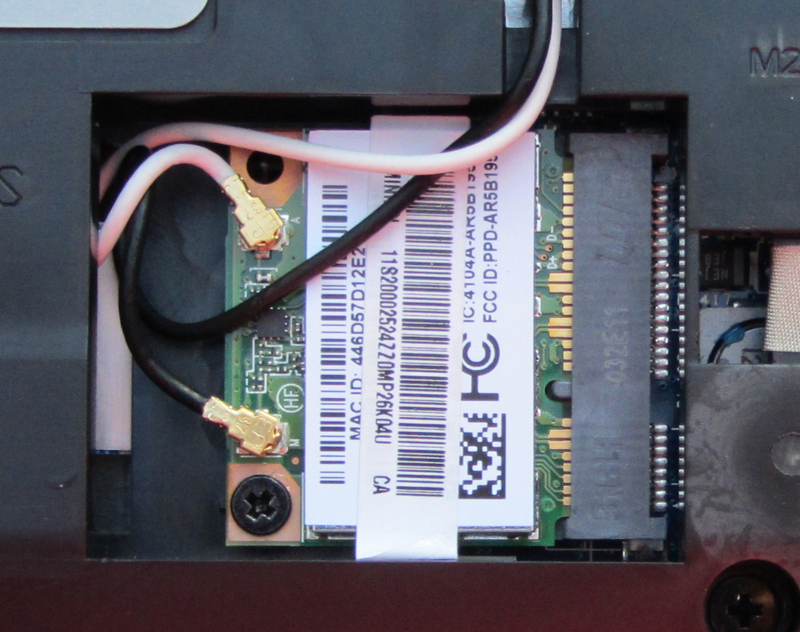 One should always keep in mind that this computer is powered by netbook components. The strengths of the G585 are clearly in other areas. The Lenovo G575 deserves criticism by us for its fans. It is very loud sometimes - even in idle mode. Under full load, the volume reached clearly disturbing levels. The Lenovo G585 is much better here. The unit always stays quiet in idle mode. The fan runs constantly, but it can hardly be heard. Well done. Lenovo has managed to lower the volume under load from 39.6 - 41.3 dB(A) (G575) down to 33.2 – 36 dB(A) (G585). They deserve praise for this too. It should be pointed out that the large volumes were only achieved during our full load test. This test is torturing the notebook running simultaneously the FurMark and Prime95 benchmarks. 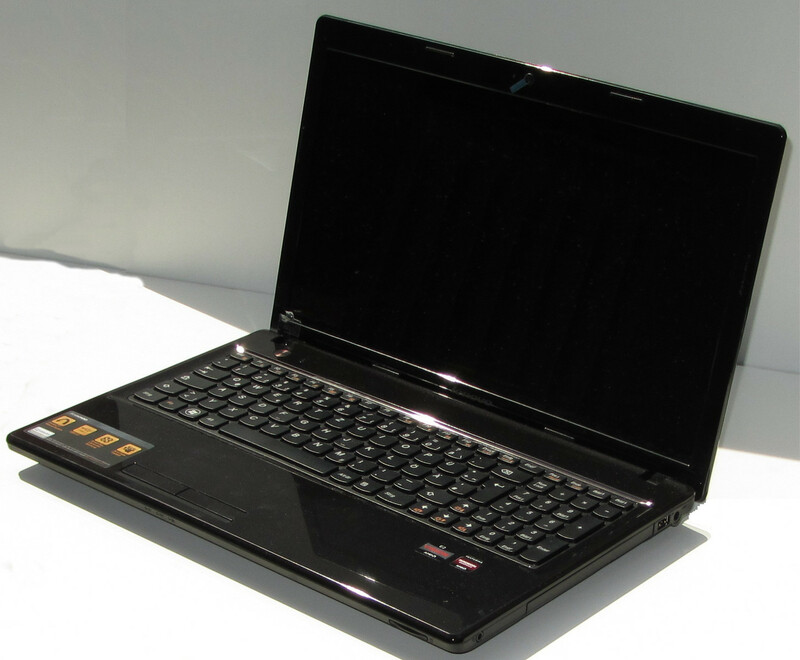 In daily use, the Lenovo G585 proves to be a quiet notebook. Only the DVD drive makes some noise. Most users would notice when watching a DVD, if at all. But then the sound of the movie drowns out the DVD drive. The Lenovo G585 in stress test. We praised the low operating temperatures of the Lenovo G575. Even under full load, the 30°C mark was reached at only one measuring point. The Lenovo G585 cannot completely catch up with this. It is warmer while idle as well as under full load. However, the temperatures of the G585 are still perfectly fine. Under full load, the notebook achieved a maximum temperature of 34°C at two measuring points. In idle mode, we were able to measure temperatures exceeding the 30°C mark at two measurement points. All in all, one can work comfortably well with the device, even under full load and even if the device is balanced on the lap. The palm rest stays cool all the time. 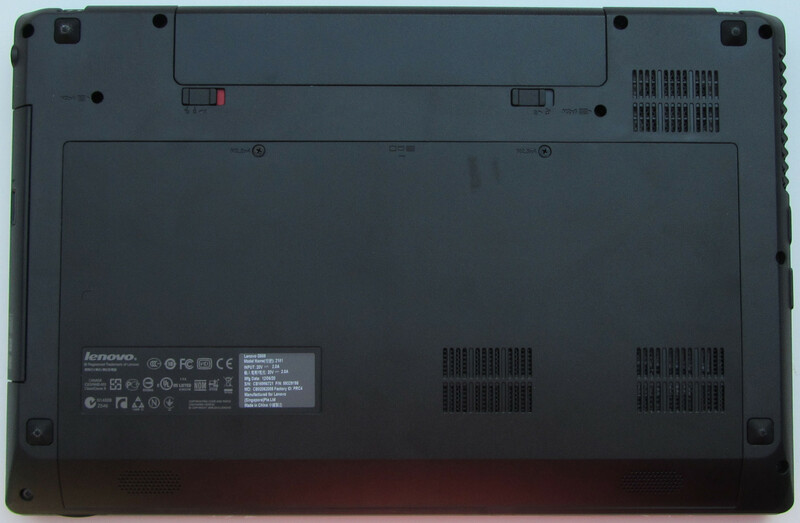 The stereo speakers of the Lenovo G585 are - in contrast to the G575 - at the bottom of the notebook. The speakers produce a perfectly acceptable sound. Speech is easy to understand. We have tested many notebooks with way worse speakers. For an office device, the speakers are more than adequate. In terms of power consumption, Lenovo has done a great job. The level of its predecessor has basically been kept. The maximum power input of the G575 under full load is 28.8 Watts; the G585 reaches 29 Watts. 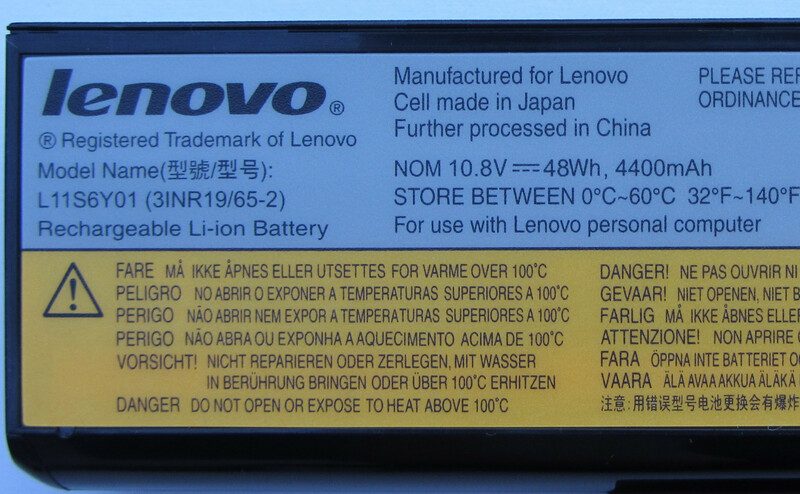 The situation is different in idle mode: Lenovo managed to undercut the good values of the G575 (7.9 - 11 Watts) with the G585 (5.7 - 10.5 Watts). The tiny power supply (8.8 cm x 3.5 cm x 2.6 cm) (3.5 x 1.4 x 1.0 inches) provides 40 Watts maximum. This is more than adequate for the notebook. The battery has a capacity of 48 Wh. In idle mode, the computer stops after 8:40 hours. The Lenovo G575 has a battery life of 6:52 hours. We are testing the idle mode with the Battery Eater Reader’s test. Here, the screen operates at minimum brightness, the energy-saver profile is activated and the wireless modules (WLAN, Bluetooth) are deactivated. Under load, the Lenovo G575 lasts for 2:19 hours, which is slightly better than the G585 with a duration of 2:02 hours. In the load test, the notebook completed the Battery Eater Classic test. Here, the screen is running at full brightness and the high-performance profile and the wireless modules are activated. A single battery charge held the practically relevant WLAN test running for 5:00 hours. The Lenovo G575 yet squeezes another 13 minutes of running time out of a single battery charge and therefore reaches a total of 5:13 hours. In this test, websites are automatically opened in 40-second intervals by a script. The energy-saver profile is activated and the display brightness is set to approximately 150 cd/m². In the DVD test, the notebook reaches a running time of 4:01 hours. That is enough to watch two long movies. In this test, the G585 again beats the G575, which offers a running time of 3:31 hours. For the DVD test, the wireless modules are switched off and the screen is set to maximum brightness. The energy-saver profile or a higher profile (if the DVD does not play smoothly) is used. For a computer in this price range, the battery life is excellent. Even many much more expensive laptops do not reach this battery life. Here, the low energy consumption of the components becomes noticeable. The question from the introduction can be easily answered at this point: with the G585, Lenovo offers a promising office notebook. The term "netbook in XL" hits the bull’s eye. The buyer gets a cheap notebook, which has a long battery life, is quiet and cool, and also consumes very little energy. For such features, one usually has to spend way more money. The good keyboard should be highlighted once more as well, something that should not be taken for granted in such a cheap notebook. The G585 easily masters daily computing tasks like word processing, reading/writing emails, chatting, Skyping or watching DVDs and YouTube videos; but nothing more. The performance of the netbook APU is limited. Even the slowest Intel Celeron processor provides more computing power than the CPU part of the AMD Vision E2-1800. Those, who want to play demanding computer games or do intensive photo or video editing, should not even think about buying the G585. If someone is looking for a cheap typewriter, which handles all types of intercommunication and can, in addition, play videos of all kinds, he is making a good choice with the G585. 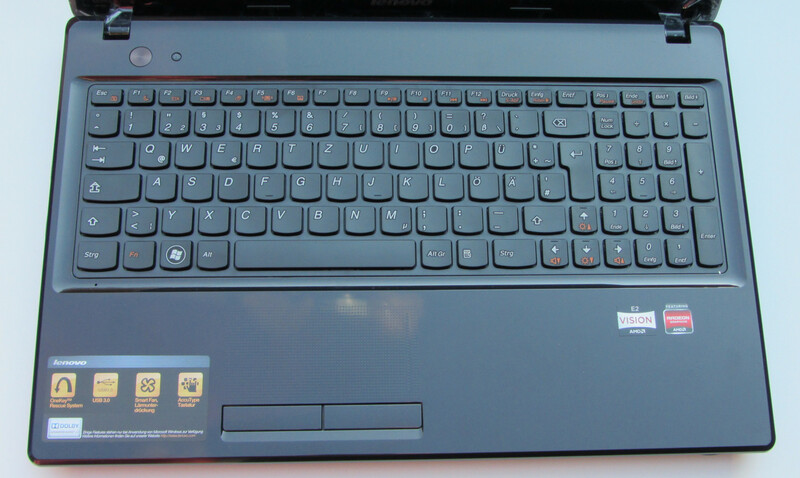 Users of conventional netbooks should take a look at the Lenovo G585 too. If you are tired of staring at a small netbook screen, you might do better with the G585. For a price of 339 Euros (~$428), the buyer gets a sound offer. 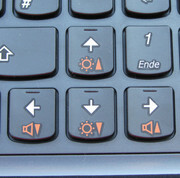 The right "Shift" key and the "Backspace" - and "Enter" key are smaller than usual. ... can provide a maximum power of 40 watts. 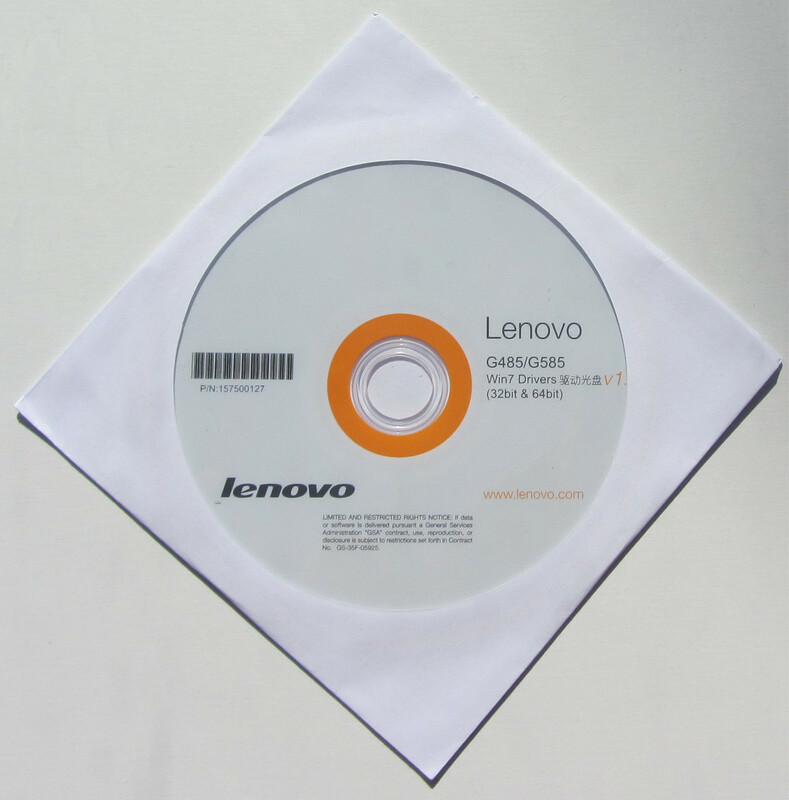 If Windows 7 is installed onto the computer, necessary drivers are on a DVD. 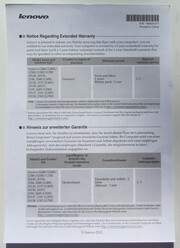 Surprise: Lenovo extended the warranty to 24 months - at no extra charge. The latter starts a Lenovo recovery program in pre-installed Windows 7. 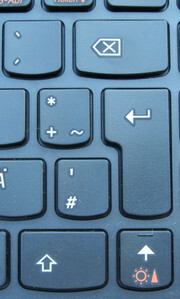 The power button (on the left) and the OneKey Rescue button (right). The media player can be controlled with the multimedia keys. 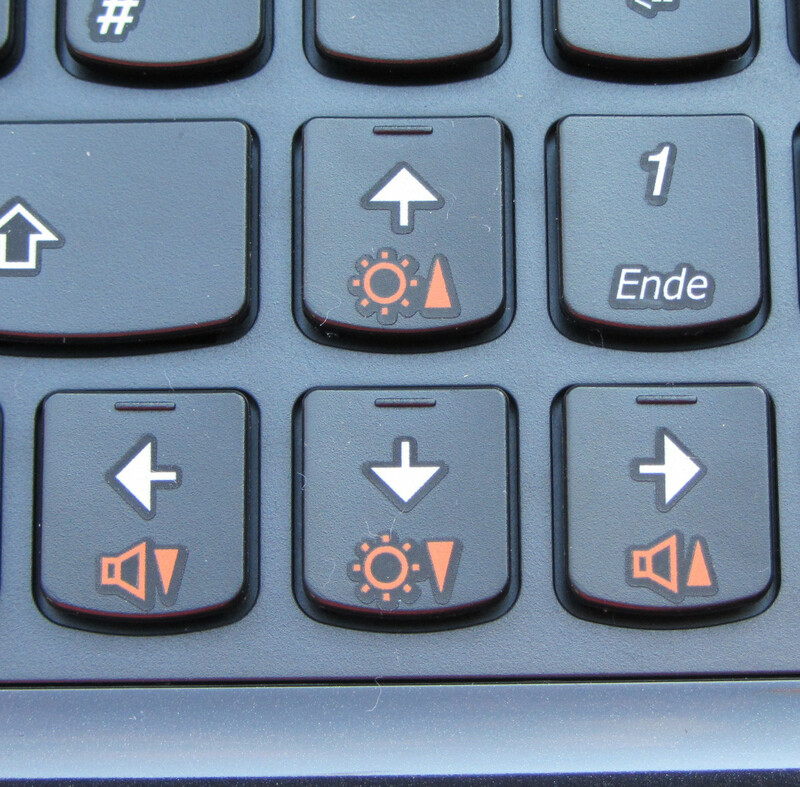 Good: the orange makes the function keys clearly visible. Only limited access to the fan. The wireless module is by Atheros. The hard drive can be removed within a few steps. The Lenovo G585 can use up to 16 GB of memory. There is a large access door on the bottom of the computer. Good: The webcam has a power light. 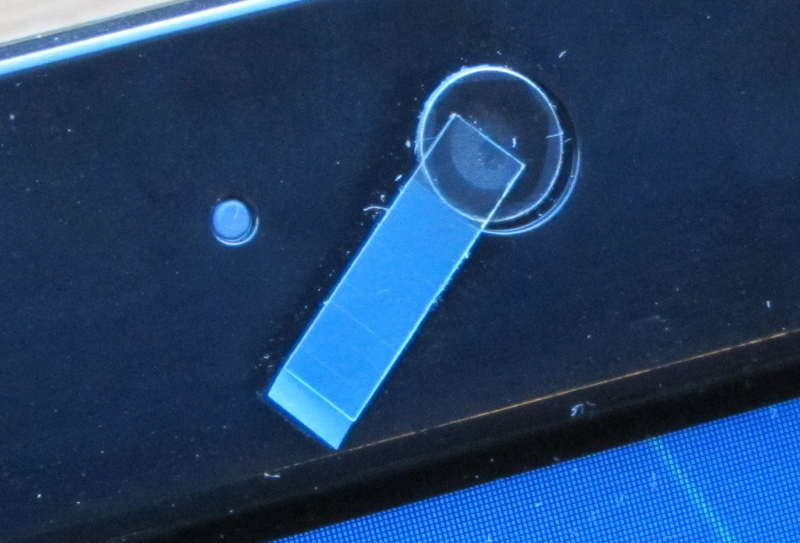 The memory card reader is protected from contamination by a dummy. The DVD burner describes and reads any type of DVD or CD. The notebook has two USB 3.0 posts and a good keyboard. Furthermore it operates very quietly most of the time. We also like the 24-month warranty. The notebook would significantly profit from a better display. There are better display available for so cheap notebooks as well. The long battery life. Even much more expensive notebooks do not have such a long battery life. Competitors of the Lenovo G585, besides the predecessor Lenovo G575, are the HP 635 LH416EA, Acer Aspire 5253 and Acer TravelMate 5744Z-P624G50Mikk.